Just a quick thank you for a brilliant service. The refurbished furniture looks great and probably better than we originally bought it. The colour is perfect. Lee coordinated things well by giving us a 30-40 minutes heads up to his arrival so we would be ready, or perhaps it was to get the kettle on for coffee. I will send more photos of the large table when set up, in situ, but for a starters I have included a few of the small table, a few chairs and the bench on the patio. Please thank Alan and Lee again for a very professional service and our thanks to you for managing the process so well. We would have no hesitation in recommending your services to anyone we know. Now I’m going out to be sit on the refurbished furniture to read the paper and having a coffee in the sunshine. "I am so pleased with the furniture, thank you so much" - Sue Lockstone, 2017. 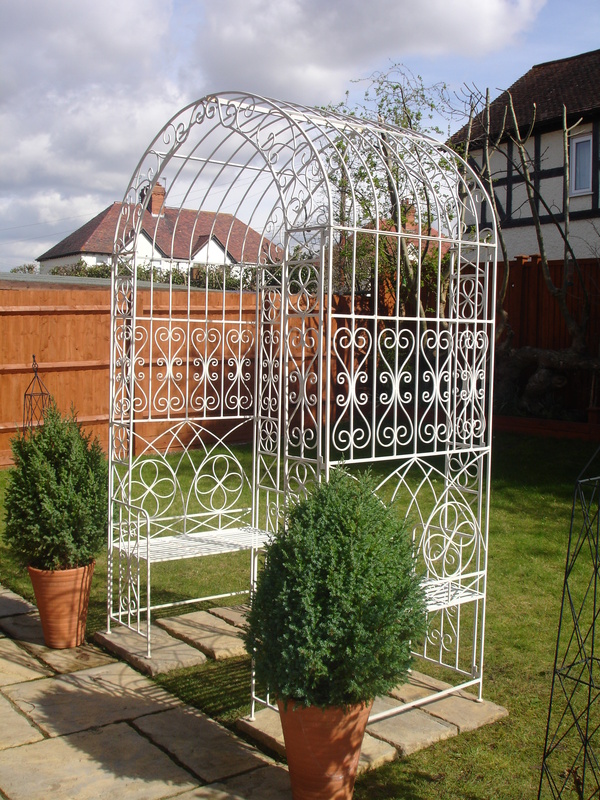 "The garden archway and bench look great. We wanted to let you know we are very pleased with the finish, paint and colour. We will definitely recommend you and contact you again should we require your services in the future. Thanks again." - Loretta & Mark Coleman, 2015. "They are great!! Its hard to believe how rusty they were. A bit 'whiter' than i expected but they are a million miles better than what they were like." 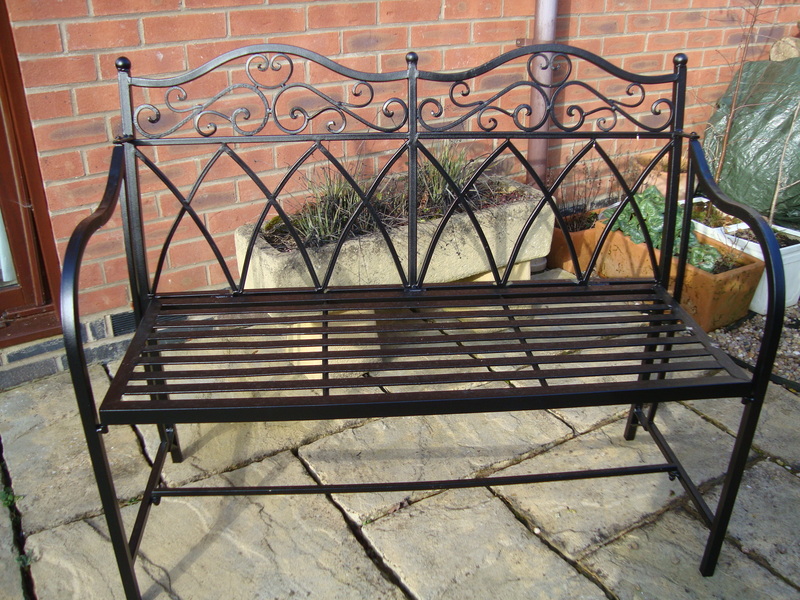 "We are delighted with our refurbished garden furniture - it looks like new and we can now enjoy it for many more years. Thanks again." Julie and Chris McGoldrick, 2013. Mr & Mrs Taylor, The Old Stables, Stow on the Wold. Extract of an article published in the SelfBuild & Design Magazine Feb 2007. “When we first cleared the site, we came across the iron rims and axles from an ancient cart, and we’d had the idea of turning them into a sculpture for the courtyard. The man with apparently the right credentials is in a nearby village. “Is that Mick Keepence?” “I’m afraid so" comes the response with a twinkle in his voice. Mick is a tonic. "Ahh, tyres,’ he says patting the giant rusty iron rims. He tells me how the old wheelwrights used to forge-weld them, then get them red hot so they’d clamp onto a wooden spoke-frame as they cooled. breaks them apart again when i want to do something different. His son helps him heave the result down from the work-bench, and his wife and daughter – half a dozen beagle puppies at their heels – join in the debate on what colour the sculpture should be powder coated. Must be the self builder’s heaven, this!